This is the first week I have been in one place for more than three days at a stretch in months. I can already feel normalcy returning. Like I mentioned last week, a good portion of my summer was spent in the car. It seemed I was always just arriving or just leaving but never in any one place long enough to just be. As monotonous as all that driving was, long rides give you plenty of time to think. While reading endless bumper stickers, euros, vanity plates and the ever-present college decals, I began to wonder why everyone feels so compelled to advertise. I’ve always been told I wear my heart on my sleeve, but I’ve never felt the impulse to carry it over to my car. Not to mention with a surname like mine, vanity plates are definitely out of the question. Think of Seinfeld’s “Assman” episode. 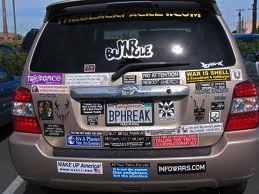 For entertainment I concocted a little game in which I tried to determine how much I could learn about a person from what they displayed on their car. Typically, I could discover how many children they had, their gender, the schools they attend and their IQ. Pets got equal billing. I can also learn the places they like to visit, the state in which they live, political preferences, religious beliefs, sports affiliations, hobbies and occasionally, their occupation. Their choice of vehicle also says something about them as does the speed at which they drive and in which lane. That’s more than I get at most cocktail parties. All this without ever meeting the driver. In fact, by this point I’ve already decided as to whether I’d even want to meet them. Luckily, at that point the waitress arrived to take our dinner order. Divine intervention for sure. The conversation ended there, but I should have added that I would hope my Christianity would be defined more by my actions than by my choice of jewelry or bumper sticker for that matter. We may not all display them around our necks or on our cars, but we all wear our beliefs on our sleeve to some extent because they should be obvious by how we live our life, how we choose to project ourselves to the world. Despite the awkwardness of the exchange – or maybe because of it – that discussion stuck with me for a number of reasons. It made me reflect more deeply on exactly what the cross means to me. It revealed a non-Christian’s perspective, which I never would have known, imagined or appreciated. It made me wonder about why people can wear all kinds of crazy labels on their cars, their t-shirts, and even on their bodies; but it seems that only when there is a Christian message do people get offended. Why does tolerance not extend to the majority if, in fact, we are one? Could it be that other non-Christians share the perspective my dinner partner had in response to my necklace? I’m not sure. Trust me, some of those bumper stickers I read this summer were more than I wanted to know about anyone and definitely more offensive than my necklace. My son and I were driving to New Hampshire last week on a one-lane road. We were a captive audience to this statement, “I’m not your b*&%@!” I’m being delicate as it was spelled out on the bumper sticker. Thinking this was some sort of new slang, I asked my son, “What the heck is that supposed to mean?” Confused because it couldn’t have been more obvious to him, he answered, “That she’s not your b*&%@. What did you think it meant?” That’s about as deep as it gets with a 16-yr-old boy regardless of the length of the ride. There were plenty of others I wouldn’t even repeat, but I did see two that were excellent messages regardless of your beliefs. Lastly, the most important effect that conversation had is that every time I choose to wear that necklace now, it is with a renewed appreciation for what it represents and with enormous gratitude that it isn’t my behavior that my eternity rests on but Christ’s. Which brings me back to last week’s topic of balance. By this time of year, I am so off balance that my behavior is not living up to any outward sign of my beliefs. I would NEVER put one of those fish stickers on my car because after all those hours on the road this summer, my tolerance for other drivers is nonexistent, and I wouldn’t want to be out there contradicting myself for the world to see. In fact, I haven’t worn that necklace recently either – probably for the same reason. Thankfully, with a week of my new Life After Labor Day routine under my belt, I am beginning to regain an inner peace that was sadly lacking this summer, and Bob is already down one notch on his belt. My Easy Silence workout isn’t helping my midriff much, but I am definitely lighter in spirit, which helps me remember that "When God measures your worth, He puts a tape measure around your heart not your waist." And in that case, big is definitely better.